Looking at the "Game of Kings" from the Queen's point of view. I'm back in New York, and I've already played in Thursday's cracktion at the Marshall without finishing up my US Open report. (In case you're wondering, after 2 straight weeks of 0-3 there, I finally broke through with a score of 1.5 - 2.5. Details to follow in another post.) Back to the US Open. Now I will attempt to catch up with the rest of my US Open stories, before moving onto other things. Saturday was an incredibly busy day. It started at 8:00 AM with a very nice breakfast reception for the delegates. When I heard the hotel was having this reception for us I was expecting coffee, tea and some pastries. They did have that stuff, but they also had these fresh fruit kabobs, strawberry drinks, and freshly made egg sandwiches. It was actually a real breakfast. It was a nice change from my bowl of cereal that I had been eating in my room in the mornings. It was nice way to start what was going to be very long and draining day. I sat with a few people I know whose politics are a little more to the right of my own. I decided I would just listen. I hate arguing about that stuff. I figured the delegates meeting would be contentious enough. I knew things were going to be different when I received this pile of papers when I received my delegates credential and materials. Usually the stack of paper is about a tenth of that. That was the pile before all the handouts distributed during the afternoon executive session. The pile doubled before the first day's session was done. How many trees died to make this pile? John Hillary of Western Chess did live blogging of the morning session. If you readers of this blog are really interested in what I sat through in the morning, you can click here. I'm not going to reinvent the wheel by repeating everything John said. He does add some of his own commentary and opinion of the proceedings. He was very spot on in his commentary. I do think that some people just like to get up and hear themselves talk. As for myself, I got up once to ask a question and that was it. No passionate arguments either way on any of the issues. The hard part would come after lunch. He also received the Koltanowski Gold Medal on behalf Rex Sinquefield who started the club in St. Louis. They hosted the US Championship in May. In October they will be hosting the US Woman's Championship. I have not yet been to the club, but hopefully I will get some time to go out to St, Louis and pay them a visit. I have never had the pleasure to work for him at any of the national tournaments that he's directed. However he's always been a big help to me when I've had questions or have needed something at the scholastic championships I've attended. Tim edited the 5th Edition of the USCF Rulebook, and has continued to do a lot of revisions of the the rules. It's a tough job. There were many more awards then what I mentioned above. I just could keep up with everyone. 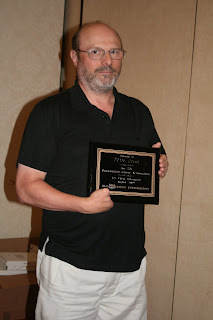 After the awards were given out then came the Hall of Fame inductions of GM John Fedorowicz and former Editor of Chess Life and Review, Burt Hochberg. 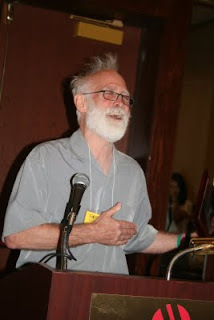 Burt Hochberg was long time Editor of Chess Life and Review back when I first joined the USCF back in the 70s. I got to know the Hochbergs from hanging out at various US Opens back in the mid-70s. 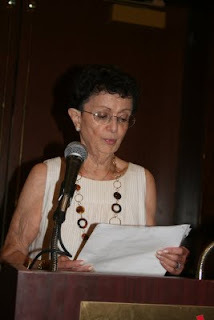 Carol gave a lovely speech thanking various people for Burt's induction. She emailed me the text, so here it is. 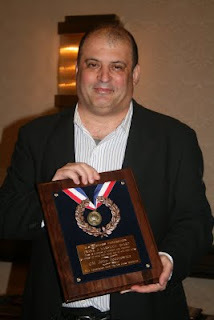 I am honored to have been invited to accept for Burt, the highest award the chess world has to offer, that of inductee into the Chess Hall of Fame. Burt would, I think, want me to thank not only those who recommended he be chosen, Dr. David Levy, and Rachel and Myron Lieberman, but all those involved in the voting procedure to make his induction a certainty. 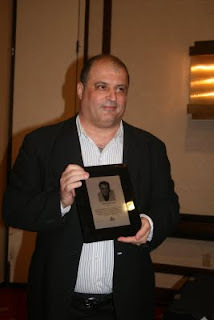 Burt would be proud and honored to stand in the Hall of Fame with those who were not only friends and cohorts, but many whom he considered giants of the chess world. For him to share this podium today, with John Fedorowicz, whom he admired and watched grow into the fine Grandmaster he is today, would have been an extra added reward. Burt loved chess, its history, its players, the chess journalists, and of course, Chess Life. Chess was Burt's world. I would very much like to thank, World Chess Champion Boris Spassky, IM John Donaldson, Editor of Chess Life Dan Lucas, Editor of Chess Life for Kids, Glenn Petersen, Grandmaster and chess columnist for the New York Post, Andy Soltis, and Former Editor of Chess Life, currently Professor at St. Johns University, Dr. Frank Brady. In closing, I would like to read an email I received from GM Boris Spassky in answer to my email telling him of the honor the USCF had bestowed upon Burt. Thank you for your email of June 23. I would like to say a few words about Burt, especially because I have very good memories of him. 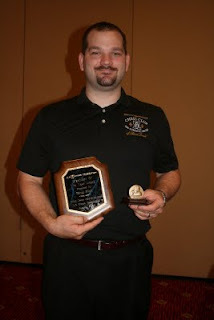 I think Burt deserves to be inducted into the USCF's Chess Hall of Fame. 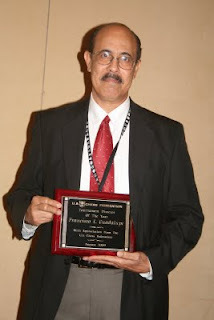 As editor of Chess Life, he established many connections between the American and International chess communities. I remember how we discussed my article about the Karpov-Polugajevsky semifinal match in Moscow, 1974, during my quarterfinal against Robert Byrne in Puerto Rico. Soon after, Burt helped me purchase and send a Ford Mustang from the USA to the USSR - not an easy task. He had, as Russians say, a lucky hand. He was my car's good luck charm. There were never any problems. The last time I met Burt in America, it was by then as old friends. We shared good memories about the past and it warmed my heart. I am very happy you will be present at Burt's induction ceremony at the US Open in Indianapolis. I am glad that many people respect and remember him. After the luncheon was done it was back to the delegates meeting. This was the point where we went into a closed executive session to vote on whether or not to uphold the ruling of the Executive Board to revoke the memberships of Paul Truong and Susan Polgar. Both sides were given time to present their case and then a vote was taken. I'm not at liberty to discuss what was presented, or the discussion that followed. The delegates did vote to uphold the Executive Board's decision. I'm sad to see that it came down to this, but they felt they had run out of options. I'd like to say it's over, but for the time being it is not. I'm going to just leave it at that. We finally adjourned around 5:30 which gave me an hour and half to try to pull myself back together and get ready to play chess at 7:00 PM. The 8th round of the US Open has not treated me kindly over the last 3 years. I'm 0-3 in round 8 from 2006 to 2008. Would 2009 be any different? It was most likely I would get paired down again since I was -1. I had not seen an up pairing since my round two disaster against Ron Burnett. Sure enough I got paired down against an 1190 who also had 3 points. When somebody who is that much lower rated then you, but has the same score after 7 rounds, you can't go by rating at all. I decided I was not going to look at the wallchart and see who had beaten or drawn with to achieve that score. I did not want to clutter up my mind worrying about that kind of stuff. He made an error in the opening which allowed me to win a pawn on f2. I played a bit tentatively after that. I wasn't convinced I would be able to convert the pawn advantage. He played very solidly, and was taking his time on each move. I was having a little trouble staying still, and got quite interested in the game of this kid playing several boards away. I had seen him during the tournament, but thought he was the little brother of one the other kids playing. 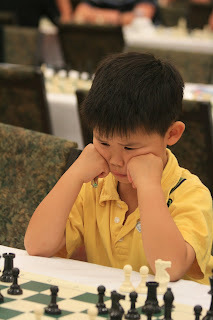 He's six years old and came into the tournament with a rating of 1510. He played 8 rounds and scored 4 points. His rating jumped to 1600. He should have been familiar to me since I had taken a number of pictures of him at Super Nationals, including the one below. He tied for second in the K-1 section with 6.5 out of 7. 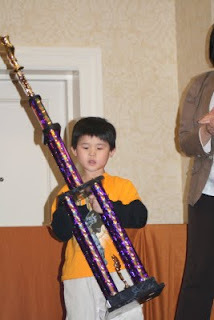 His 3rd place trophy was as big as he was. At that time his rating was 1345. A kindergartner with a 1345 rating! I don't think I even knew how to play checkers in kindergarten. Since then he has gained 250 points. Meanwhile back to my game. My opponent made one move a little too fast, and I was able to win another pawn. That finally gave me something to work with. I was able to simplify to a minor piece ending and run my pawns down the board. Here's the game. Finally I broke the 8th round curse and evened up my score. I sat next to or near Awonder in a couple of the rounds. He is so cute! I was very impressed to see him going head to head with an adult rated in the 1900s. It's just amazing to see a six year old with that kind of concentration and perseverance. Probably to much to explain but why is the membership of Susan and Paul revoked? Cant they not just being members but enabled to sit in any commitee? Why is there always so much fight in the upper levels of the USCF? A 6 year old got 4 points in the US Open?!?! Anyone have Awonder's games in PGN? I would like to view them! I love to compete, whether it's triathlon, bike racing, running, Tae Kwon Do or chess. I may be a "jack of all trades, and master of none." However I love the challenge of testing myself against others, but also against myself. After a long hiatus from the sport of triathlon, I made my return in 2014, just in time to age up. Love being back. I forgot just how much fun it is. I have added my US Open in Indiana post to the State by State blog. I have included games that I did not post in my US reports at Castling Queenside. That will probably be it for new states this year. Now I'll start working on ancient history.